There comes a time when you've been playing a game, saving it, but wants to load it up later again to continue playing. The data you stored is still there so just picking up that joystick will put you back where you started. Accel World brings back some of that simulation as we take a look what happens after the anime series. Accel World EX (OVA) is actually based on a project split into two non linear sections that were released based off the video game for the PS3 platform. Those lucky enough who purchased the game will find these gratifying gifts from the producers that comes in the form of Blu-ray DVDs for fans of the original series/light novels. 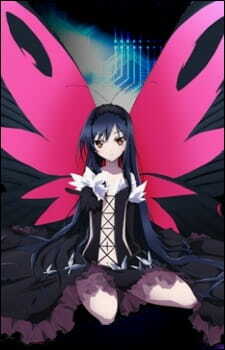 It is also based on its prequel predecessor Accel World. As such, expect many of the same themes, characters, setting, and backgrounds similar. Because it is non linear, the OVA are standalone episodes that has little to no connection to one of of the other or vice-versa. It is divided into two separate states. The first stage known as Reverberation;Zankyou still takes place in a similar setting but with a newer concept shown AFTER the original anime series. What this means is that it can be a little spoilerish but more importantly, viewers should familiarize themselves with the original series. The episode does not reintroduce all the concepts from its prequel nor are there actual backgrounds of the story from it. It is a stand alone episode and gives more of a fillerish vibe. The episode itself contains action, drama, and very small inklings of romance as compared to its prequel. In fact, I found some of the misunderstandings between the duo of Kuroyukihime and Haruyuki to be forced and weak. It is not well executed from my point of view especially with their relationship. Despite this though, the two still make a good team especially with their skills and the new concepts applied. With that concept spawns action which was surprisingly well presented. It does lack that feeling of seriousness especially when compared to the latter half of the prequel but it earn its entertainment points. The designs of the avatars remains generally the same but with the newer concepts applied that brings forth some amusing moments. This is especially true for Kuroyukihime avatar that makes her character already stand out more than she should be. As for the second episode, it follows the typical trend with most OVA standpoints in today's anime industry. That spells out a simple word: fan service. Of course, in series like this, Reki and his works makes no escape towards this trope. With many of the baring skin and lustful embrace postures, the second half of Accel World EX is a gratuitous presentation. A viewer shouldn't be surprised though because as it has become a popular trend today. Both the artwork and soundtrack remains generally the same with Hima doing the original designs and music composed by Kotoko. It focuses on the electronic rhythms and stereo-like vibrations. Along with the OP/ED songs, it brings out the cyber word that is Accel World once again. All in all, these two OVA episodes are a gift for the fans – either fans of the anime, light novels, or the video games. It's a bit of a shame that this time around, story isn't part of the formula for these two episodes. Instead, it is substituted with generics and luring visuals. Still though, it could also be a ride of entertainment if you're in for it. It's hard to say if this is a reminder that the series is still popular in Japan but given the sales, a season 2 is possible on the horizon. However, Accel World EX is up for grabs if you're in for some fun. This short addition to Accel World contributes little to the overall world, only serving as additional scenes for those still interested. The first one explores predecessors to Accel World resulting in some weird half-mech like states in the virtual realm. The second one takes place after the events of the series and serve as a bit of fan service as Mega Nebulous rests and takes a break at a spa, with expected results. If you liked Accel World, this is a fair addition. If you didn't, don't expect this to win you over. Consistent with the main series. Fairly good overall detail and colorization ruined by the blob of the South Park main character. A bit of concentrated fan service in particular scenes in the second episode. Identical to the main series. This uses the second OP in the main series as well as the same BGM and VAs. Nothing particulary special here. Pretty much explained the plot in the intro. Nothing is particularly drastic, though I found the first episode a bit far-fetched (sort of borrows the idea from SAO that being an ace in one game makes you really really good in another similar game, though I don't think good enough to beat a master at the other game). The second episode is more character-driven with some more character background and a lot of Fuuko Kurasaki. There isn't any really huge development here. You find a bit of additional detail on fat blob's past but that's about it. This was a fair watch but nothing spectacular. The first episode is more action based whereas the second is a relaxing break. For Accel World fans.